National War Memorial, Manifestation of Luteyns’ Order, Competition Entry by Design Forum International - ArchitectureLive! The architectural construct of the national war memorial calls for the visual grandeur befitting a national monument and enmesh seamlessly with the magnificent India gate and the traditional Indian chattri. The visual grammar, vocabulary and material palette must be drawn entirely from lutyens’ architectural style; it should be like ‘Another Avatar of the Lutyens’ Order’. Equally, the experience intends to invoke in the visitor, the spirit of patriotism, allowing him to pause by creating a controlled visual field and guiding him/her to slowly transition towards a silent, solemn experience of respect and gratitude towards the brave soldiers who put ‘the nation before self’. The memorial is placed along the formal axis of the Rajpath and near the cupola – chhatri. This is because the central zone has the gravitas needed for such a memorial. This location also works well with the current trees on the site, it easily avoids the large ones, and the small two or three trees it touches can be transplanted. Most of the green expanse of the hexagon is left untouched. The not so wide central road that links the chhatri to the national stadium would have to move around the memorial much like it does around the India gate, except that these would be narrower as this lane is rarely used. A brave soldier’s life is dedicated to the triumph of the Indian tricolor. An officer once said “I’ll either hoist the tricolor or come wrapped in one”. 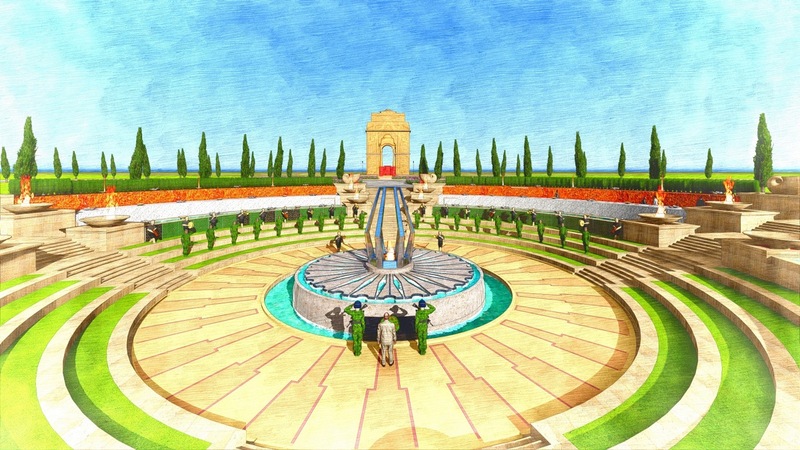 The design proposal picks this emotion as the central theme and places the Asoka chakra at the heart of the memorial along with ‘the eternal flame of patriotism’ that sits in the eye of the chakra as a sort of a sacred altar. 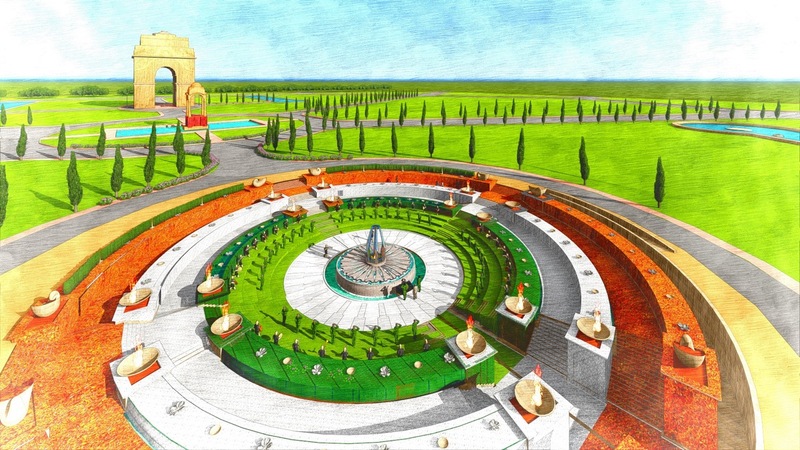 The entire memorial is conceived as a circular stepped sunken open court with 3 concentric water bodies raised on walls that would hold the names of the brave soldiers inscribed in stone. 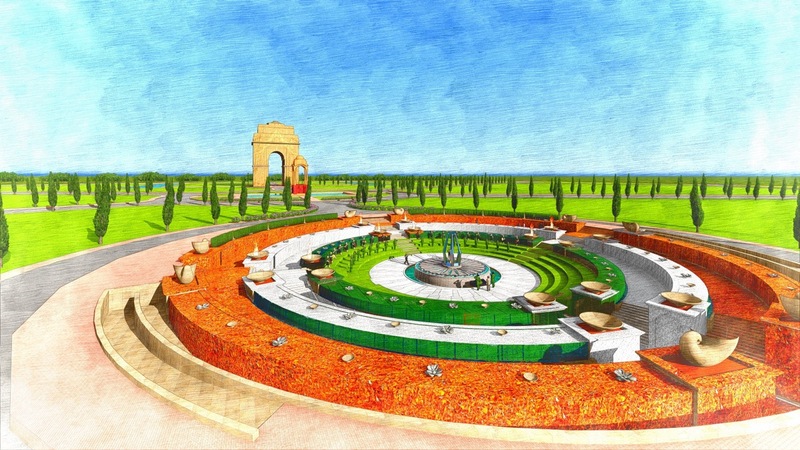 The concentric rings are arranged in a stepped manner with each subsequent ring being 1m lower than the previous one, and together they envelop a green amphitheater which in turn envelops the Ashoka chakra within which sits the central altar…., ‘the eternal flame of patriotism’ sitting within a jewel like a void which represents protective shield that the defense forces provide to the people of our nation. 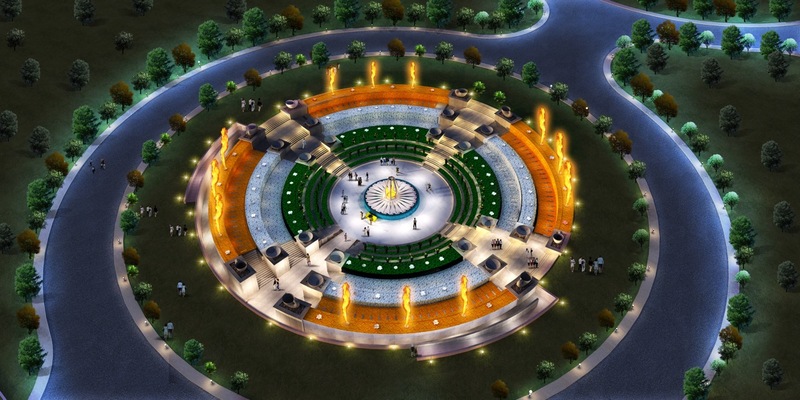 The concentric rings are planned to be adorned with flower decoration of tricolors on all important days and when seen in an aerial shot on the republic day, would read as a circular adaptation of the tricolor with the Asoka chakra in the center. The concentric rings of water would also house gas fired flames. Every evening there would be a military band performance and a sound and light show which would enhance the engagement of the citizen with the soldier. Reflection of the India gate within the water feature would add a new dimension to their visual integration. The water feature would also enhance the micro-climate of the much barren space. The design aligns well with the principles of universal accessibility and sustainability. 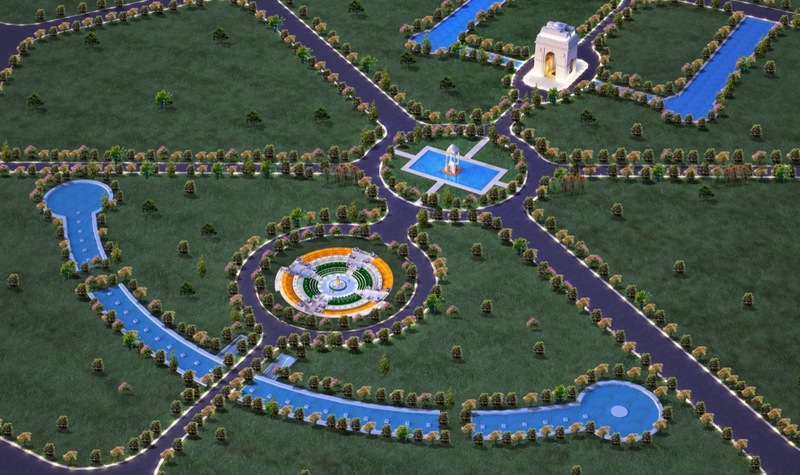 A ‘c’ shaped curved water feature is also created in response to the two linear water feature that runs parallel to Rajpath. These features have a tunnel underneath which would be used to connect the memorial with the national war museum. Interesting glass skylights are placed within the water feature to illuminate the tunnel which would also be animated with images and stories related to the heritage and valor of armed forces. Since there is height restriction of 1.5 meters, a step-down design is chosen, which allows the option of creating a meaningful central altar, while reinforcing a sense of solemnness and silence that one shall experience while walking down inwards or circumbulating the haloed walls. In the middle zone, the visual field shall comprise of just the memorial and the chattri and the India gate completing the object of their integration into one entity. The memorial is designed in a manner that it provides a transitory time of 10 to 20 minutes to absorb, observe, touch and feel the stone inscriptions, light a candle, pay obeisance at the central altar and finally be able to sit for a while, in a soothing and silent space to reflect and become a part of this ‘Temple of Valour‘.